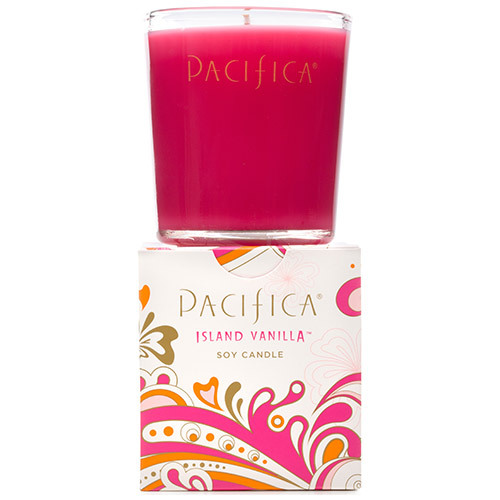 Pacifica Soy Candle Island Vanilla - 160g - Perfectly fragrant, colorful and clean-burning, Pacifica Soy Candles are handmade with vegetable soy wax, lead-free wicks and Pacifica`s signature perfume blends with essential and natural oils. A proprietary blend of natural soy wax, vibrant color, lead-free cotton wicks and Pacifica’s own fragrance blend with natural and essential oils. No parabens, animal testing, animal ingredients or artificial colours. 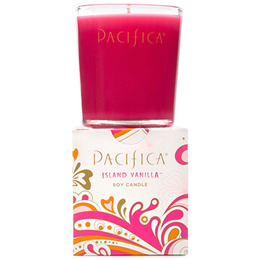 Below are reviews of Pacifica Soy Candle Island Vanilla - 160g by bodykind customers. If you have tried this product we'd love to hear what you think so please leave a review. Pacifica Soy Candle Island Vanilla - 160g - Inspired by the unique magic of Tahitian vanilla, this sensual blend sets sweet and sultry vanilla absolute, with honey-jasmine notes and a touch of fruitiness, against a deep and beautiful base of tea.